Our U7 program is for players born in - . At the U7 level, boys and girls are separated into divisions within the age group so that boys will play with and against boys while girls will play with and against girls. MASC does not have a coed option at this age group level. The U7 program is great for beginners and more experienced players alike. Players will contiue to learn and develop the basics of dribbling, shooting, throw-ins, and kick-offs through fun games and activities. Teams are created to help ensure games are competitive and fun for everyone. U7 games will be played under "modified" rules, which are intended to allow the players to more fully enjoy the game, without burdening them with the rules (i.e. laws) of the game, which they are not ready to comprehend, much less execute. "Modified" laws are typically instituted with some variation throughout youth soccer. The U7 games consist of four (4), ten (10) minute quarters. FIELD SIZE: The field size is reduced to be within recommendations. PLAYERS: The maximum number of players on the field is four (4) per team. SUBSTITUTIONS: Substitutions: either team may substitute one or more players prior to a throw-in. FREE KICKS: Except for the kick-off (which is a Direct Kick that may result in a goal), all kicks are Indirect, meaning a goal cannot be scored until a second player touches the ball prior to the ball entering the goal. Direct kicks and Penalty kicks are not taken. OFF-SIDE: Off-side is not called. All teams will be scheduled to play one (1) game per week on Saturday mornings. 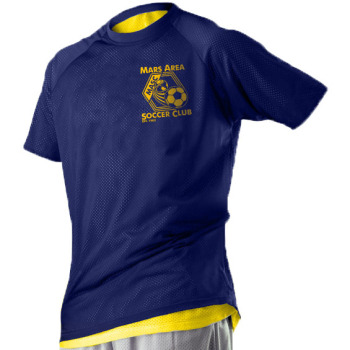 IN-HOUSE REVERSIBLE JERSEY: The reversible MASC In-House jersey must be purchased by the parent/guardian of the player. Jerseys may be purchased from our website here. SOCCER CLEATS: Shoes may be tennis shoes, turf shoes, or soccer spikes. 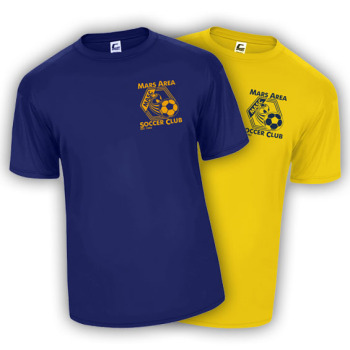 SOCCER SHORTS: Shorts may be of the athletic style, sweatpants are permitted in cold weather. JEWELRY: For personal safety concerns, jewelry is not permitted; earrings must be removed or taped. Hair accessories such as metal barrettes and plastic headbands must be removed before a game. SHIN GUARDS: Shin guards are mandatory for practices and games. WATER / DRINK: Each player should bring their own drink to every practice and game. SOCCER BALL: U7 uses a size #3 soccer ball. Disputing or verbally abusing the referees and/or assistant referees will be cause for ejection. Refrain from coaching players during the game. Make an effort to understand the laws of the game. Safety of the players and spectators. Please, understand that soccer is a game of risks and mistakes. Players must be willing to chance failure keeping in mind it is only temporary. The referees of MASC are typically youth, who, even though they have been trained and have passed an exam, are nevertheless, in the process of developing their skills as referees. Positive reinforcement from spectators and coaches is of great value in their development.